We are proudly hosting our fourth annual food drive! 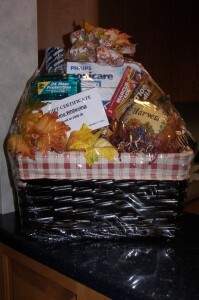 Stop into the office during the month of November and donate non perishable food items and be entered to win this great gift basket. The basket includes: Sonicare toothbrush, oral hygiene products, free custom whitening trays, a Carrabbas gift card and movie passes. Each day you donate will allow for one entry slip per day, with a limit of one per day. You may donate multiple times throughout the month for more than one entry! The need for food in our communities is greater than is has been in many years. Many of those who have donated in previous years are now relying on receiving donations themselves to feed their family. 50% of children in Milwaukee go to bed hungry every night. It is donations from people like us that can help change these statistics! Thank you to the Hunger Task Force for allowing us to reach out to those who need it most.